Is an electric train set appropriate for a 7 year old? Before spending any money on electric trains for your child, review some dos and don'ts about train sets. Be honest and determine upfront if you are getting the train set for the child or the parent? You might not want to get a complex train set for a 3-year-old just because dad is reliving his childhood. Very young children may be fascinated by electric trains, but they certainly won't be able to set them up and run them. Do some research first on age appropriateness, different sets, and the stages of electric train set modeling. A common opinion is that children should not be given electric trains until they are 8 years old. 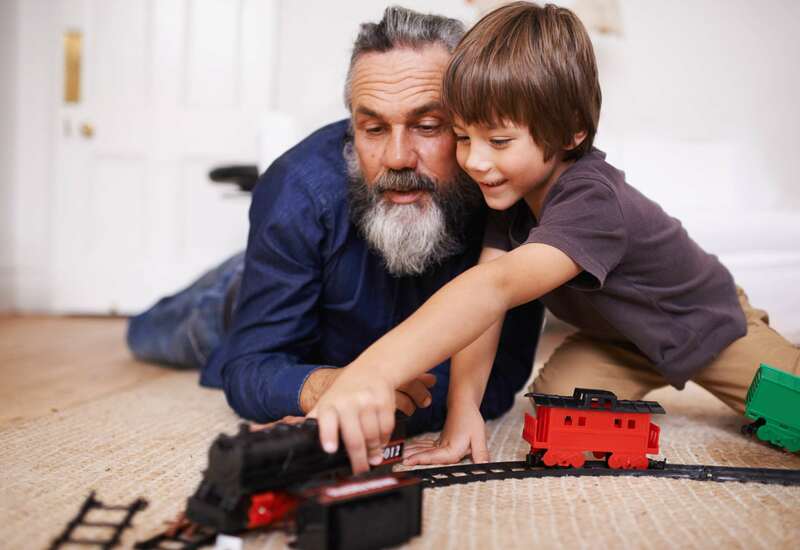 Although age 5 can be a good age to transition from push toy trains and battery-operated trains to electric trains. It really depends on the child. Age brackets for advancing skills are only guidelines. Do not limit your child if he or she shows a serious interest in moving ahead and the aptitude to do so. From an educational perspective, the purpose of electric trains for younger children is to help them develop hand-eye coordination. They do this by learning to control the speed and direction of travel of their train. Also, this is a recommended practice for children with autism. Children under five thrive on push toy trains. Brio, Lego trains, and the Thomas the Tank Engine toys are popular choices. Thomas the Tank Engine is pretty much the rock star of toy trains for younger children. There are a lot of Thomas toy train products available. Children can spend hours laying out these tracks and pushing these wooden trains. A good starter electric engine set is the Vtech Go! Go! Smartwheels Train Set, which can be good for children as young as age 1. The tracks are interlocking, interchangeable plastic pieces that inspire imagination with different track configurations. The motorized train makes sounds, says phrases, and plays music. There are ramps, a hand crank, and even foreign language phrases that can be heard at different checkpoints (called Smartpoints). A child's first electric train set should always be set up and run under adult supervision, particularly when it is new to the child. The voltages on the rails and power pack terminals aren't sufficient to cause an electric shock, so it's no less safe than a video game. But setup and operation aren't necessarily intuitive for younger children. Having the layout space for a toy train tables is key to a child's enjoyment of their model trains. Also important is the scales (size) of the trains selected for children. Most O scale train sets make directional control difficult. This is one of the three reasons O scale is not recommended for children. When a child gets their first electric train set, the next thing they want is more track. The basic oval of track that comes with a train set can be boring. Your child has probably already been building more elaborate layouts in Brio or Thomas wooden tracks. Limiting them to an oval will be frustrating, so invest in some additional track pieces soon after giving your child a train set. Do not, however, go through the expense of buying any turnouts (switches) for them just yet. Stick with straights, curves, and crossovers. At this point, giving children curves of different sizes will introduce some very fundamental concepts of geometry to them. This will require them to expand their problem-solving skills when laying out their track. Trestles will add interest also. Without turnouts, your child's layouts will be continuous loops. up front does not mean that they are stuck with an oval. There are a number of types of continuous loops you can teach them to build: twice around, dogbones, folded dogbones, and so on. There should be enough variety to hold a child's interest while they are mastering their throttle control and track placement skills. Two turnouts that can divert a train on and off of a short parallel track is a siding. To introduce your child to switching, start by adding a siding to your child's continuous loop layout. In the real world, sidings are used for parking a train briefly so that another train can pass. This would be a good next step in your child's model railroading. Turnouts are the most expensive track pieces in model railroading, inspire if they can be switched electrically by remote control. Just be aware that remote-controlled turnouts require additional wiring connections. This may be another educational opportunity for your child. up front But unless you are running a three-rail system, making two trains approach from opposite directions on the same track requires digital command control, which can be a pricey addition. Another consideration when running trains in opposite directions is the overall length of your child's track. You will need a long continuous loop of track to run oncoming trains, or things will happen too fast for your child to control them. At age 8 (or younger, depends on you and your child's commitment level), you can begin building a permanent train layout with your child. It is at this point you would introduce landscape construction. These projects can take years. There are some model railroad camps for children around the country like T-trak.org, which has a youth program for scouting groups and other children's organizations. And, there is a children's group building landscaped models at the Rosenberg Railroad Museum in Rosenberg, Texas. The benefit of learning in a group is that each child makes their own small module, and then the group can connect the modules together and run trains on them. A time saver layout is a puzzle game. This is probably most inspired around age 11. Time savers are a fun way to keep older children interested in their railroads. A time saver is a small railroad yard layout. A switching locomotive is placed on the layout with a number of railroad cars. The cars are placed at diverse positions on the layout. The operator uses the locomotive to collect the cars from their different tracks and assemble them into a train in the proper order on a specified track. The goal is to build your train in the least "moves" and the shortest amount of time. If your teenager is new to model railroading, they will get the most out of it if they progress through the stages of modeling for younger children but at an accelerated pace. If your teenager is serious about model railroading, then he or she may be ready to build a real layout on their own. If you can make room for one in your basement or garage then, that is great. But, if not, help them get involved in a club. At a teen club for model railroaders, teenagers can build modules and display them at shows. Showing a well-made module can be a great self-esteem builder. What Are Necessary Electrical Terms for Model Trains?